Meet Eric and Leslie our new alpaca guardians. Eric and Leslie are named after two of our grandparents and join our chooky girls who have the names of great aunts Myra, Mavis, Myrtle and Muriel and of course Geranium the Dexter cow who was named before we got her. For a while I had contemplated Latin names for them. Perhaps Pablo and Neruda after the poet? Perhaps Gabriel and Garcia after GG Marquez the author? Perhaps Fidel and Castro after the Cuban leader? Still as little wary of us, ears back! Then I pondered on Kerry and James (Packer - get it? - perhaps a joke only really understandable for the Australian audience) but then I thought that I would instantly dislike the poor little furry things and decided that being named after a media mogul and his gambling mogul son was not a good idea. In the end, as the alpacas were the only males in our herd, I gave the honour of naming to The Lad and a fine job he did too. So Eric and Leslie they are. At first we thought the skinny Leslie to be the dominant lad, but then the other day I witnessed them eating the grain I had set out for them. 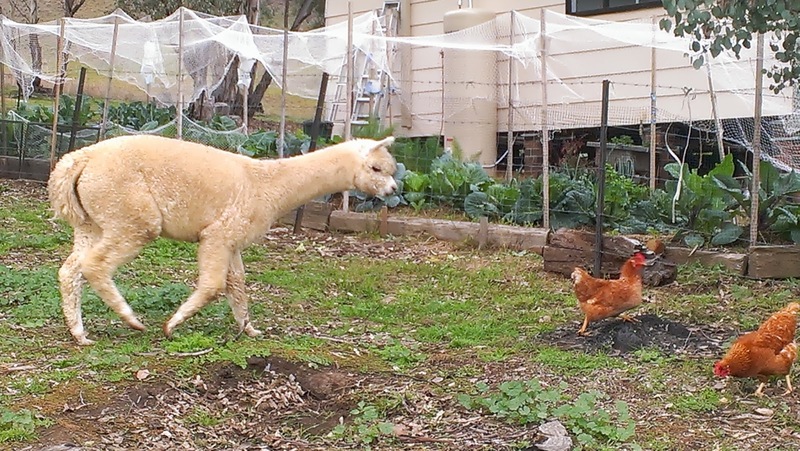 Eric dominated the container and promptly spat (as alpacas do) at Leslie several times when he approached for a feed. Very unpleasant! Poor Leslie, he didn't get to eat any of the food. When they are not spitting, they make a very pleasant humming sound. Eric and Leslie will guard our mob of sheep (when we get them) from foxes and the rumoured wild dogs and hopefully keep our cow somewhat company in the paddock. He does seem to have a furry face doesn't he? They are the same age but look quite different. 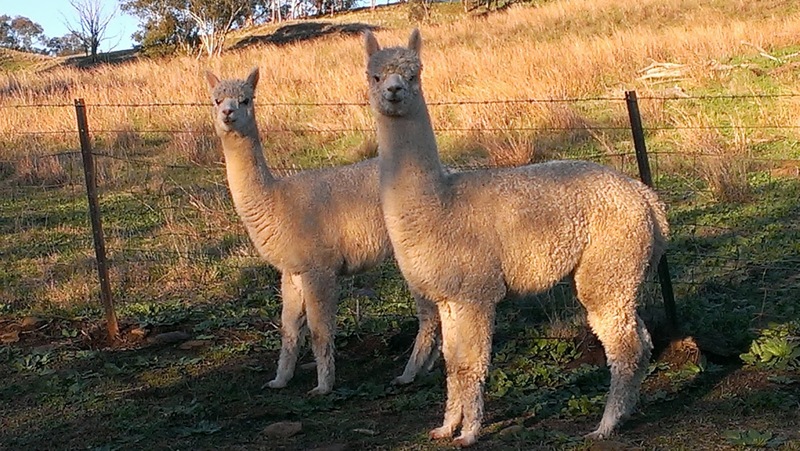 Apparently they stomp on foxes and anything else that threatens baby alpacas and sheep. Yes Eric adn Leslie are much friendlier names than the tempting punning. I also have a grandfather named Leslie and he swore that "ie" spelling was the boys' way!? Oh you might be right on the spelling. Lesley/ Leslie was one of the lads grandfather's. I will have to check with the lad. 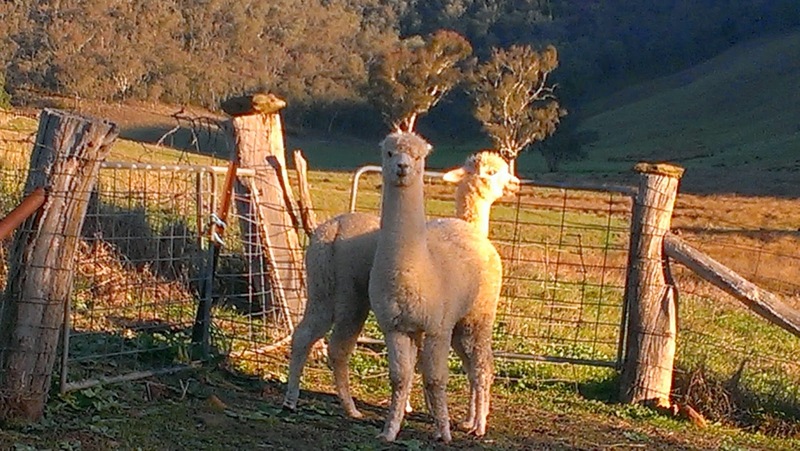 A humming alpaca sounds lovely. They have such interesting faces. I am partial to a bad pun and although I'm not sure either Kerry or James ever make a pleasant hmming sound the spitting seems somehow apt.